While spending a good amount of time in the car on our road trip a couple weeks ago, Taste Tester and I decided to count how many states we’d been to. After tallying him at 34 and me at 25, we decided to add another new one to the list: Arkansas. It was only a short drive away from where we were staying in Springfield, MO so we decided to take a day trip there. 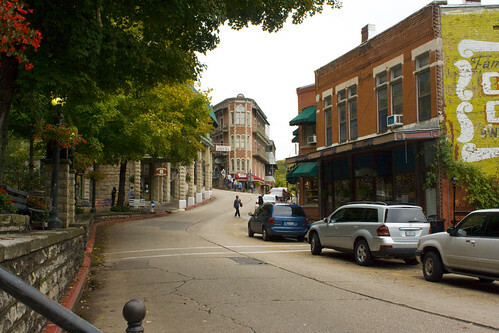 After getting some recommendations on various cities and parks to visit, we chose Eureka Springs. It’s a quaint town that’s got a similar vibe to Woodstock, NY (if you’re a north-easterner). The difference is that it’s larger and there are tons of awesome Victorian houses scattered all over the place. Though his wife recommended it, Shawn was a little hesitant to send us to Eureka Springs with the stipulation that the downtown is mostly full of quilt stores. While we can confirm that you can find many a quilt there, you will also find other fun little shops including this well-stocked candy shop called Two Dumb Dames. The large fudge selection takes up the left counter in this photo. They also sell lots of classic candies, chocolate-covered nuts, and even t-shirts. Of their giant fudge selection, I chose the White Chocolate Raspberry Fudge which was delicious (and satisfied the white chocolate raspberry kick I seem to be on), but they also had Peanut Butter Fudge, Tiger Fudge (chocolate and peanut butter striped fudge) and Butterfinger Fudge. 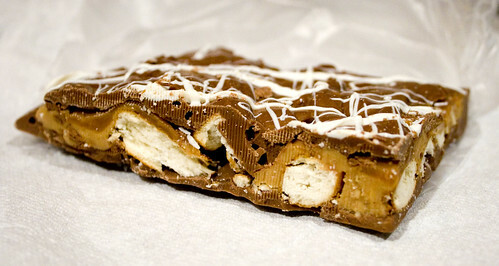 We instead opted for the Pretzel Explosion – it’s an inch thick free-form chocolate treat that included a layer of milk chocolate, caramel, peanut butter, pretzels, another layer of milk chocolate and some white chocolate drizzle. It was basically a homemade version of a Take 5. I loved it. Their milk chocolate wasn’t quite as good as the milk chocolate from The Old Market Candy Shop, but once you slather it in caramel, peanut butter and pretzels, it’s pretty hard to resist. If you ever find yourself in Eureka Springs, AR make sure to swing by Two Dumb Dames to pick up some of their tasty quilts – er – fudge and a hunk of their Pretzel Explosion. Hey, who’s blog do you think this is?? If I want to rename chocolate pretzel treats and change state acronyms, then you just have to deal!